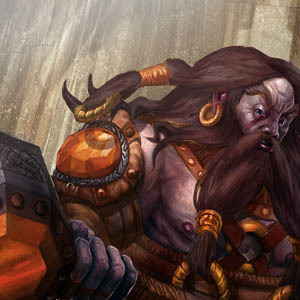 Necrol Lazeren is High King of all Crag Dwarves in Merovia as well as the king of Blackhelm, the capital undercity of Crythia. He is popular for his actions in the last century that brought the two large Crag Dwarven nations together under one banner. Lazeren was well liked and as a whole convinced the dwarves that Merovia’s depths can be shared and it is that love of the earth that brings them all together. In the last 2 years though he has begun sealing himself in his castle and has made little to now communications to the other dwarven clan leaders. Turmoil is spreading, and rumor has it that something is poisoning his mind.